Cambodia’s first opposition-aligned television station will begin broadcasting around the country by the year’s end, with a group of investors close to the CNRP now raising the $3 million needed to launch operations, opposition leader Sam Rainsy said Sunday. “It will start before the end of the year,” said Mr. Rainsy, who explained that the station will now be the CNRP’s main focus following the launch of the reformed National Election Committee last week. “There are several technical options we are exploring. One is to rent equipment instead of building it. Some equipment, such as towers, can be hired, and that will allow us to broadcast before the end of the year,” he said. Broadcast media in the country is dominated by the ruling CPP, and the present selection of TV stations is either friendly to the ruling CPP or owned outright by its members, including a daughter of Prime Minister Hun Sen. 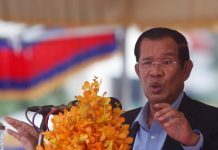 The opposition has been routinely blacked out of media coverage during elections in years past, and the promise of a television license was key to the political deal that Mr. Hun Sen and Mr. Rainsy struck last year. Mr. Rainsy said a fundraising campaign is now beginning to help launch the opposition-aligned TV station, which carries the provisional name of “Sun TV,” a reference to the rising sun image on the party’s logo. “We will make an appeal to the public for subscriptions. Suppose we need capital of about $3 million, we will issue 3,000 shares and each share will be valued at $1,000, and we will collect $3 million,” he said. Hong Sok Hour, a Sam Rainsy Party senator who has been advising the new opposition television station, said the station could launch even sooner in Phnom Penh if enough money can be raised quickly. “The main task is to raise the funds overseas and inside Cambodia. Sam Rainsy will soon make a trip to the U.S. to launch the fundraising, and there will be a big occasion there on May 30,” Mr. Sok Hour said. Mr. Sok Hour added that he was not worried that companies might shy away from advertising to avoid associating with the opposition, or that future political conflicts could lead advertisers to withdraw from the station. “This question could be asked in the old political context, but now we have the culture of dialogue,” Mr. Sok Hour said. “There is now no conflict between the ruling party and opposition party, so all we will have to do to attract advertising is to build good programs. “We will have political debates, news, education and culture [programs]. When we have an audience, advertisers will come,” the opposition senator said. The opposition’s station will not be the only newcomer to the market, with CPP senator and business tycoon Ly Yong Phat’s station “PNN” due to launch next month, according to the station’s deputy director Som Chhaya, who has been a critic of the CNRP in the past. “We will test the station from the middle of May for one month, and then we will inaugurate it,” Mr. Chhaya said, adding that PNN’s TV journalists will come from a variety of existing news organizations. “They come from many places, including CTN, CNC, The Cambodia Daily, The Phnom Penh Post and Radio Free Asia,” he said. “We will make the new station more extraordinary than the existing stations, and those who never show up on TV will appear on our station. Before last year’s political deal, the government routinely said there was not enough broadcast spectrum available for the CNRP or others like anti-government radio station operator Mam Sonando to open television stations. Information Minister Khieu Kanharith did not respond to a request for comment Sunday on whether spectrum can be opened up to others following the accommodations made for the CNRP and Mr. Yong Phat. Mr. Rainsy said that he believed the launch of the CNRP’s station will be a historic event for Cambodia.